Historically themed areas tell the story of Nova Scotia settlement from an agricultural and horticultural perspective, showcasing gardening methods, designs and materials representing more than four hundred years of local history. For 4000 years, the Mi'kmaq have inhabited the land, using this area as a stopping place. The Pine Forest represents the huge eastern forests which once covered a vast area, long before Europeans settled in North America. La Maison acadienne features the only archeologically authenticated replica of a pre-deportation Acadian dwelling in the Maritime region. The potager is based on original diary notes from the Acadian era, while the orchard and willow hedge are heritage cultivars from the 17th Century. La Maison acadienne is based on a 1671 time period when Port-Royal (later Annapolis Royal) was the centre of Acadie. The Governor's Garden presents a garden of herbs, flowers and heritage 18th Century apple trees arranged according to the traditions of the 1710 to 1749 period, when Annapolis Royal was the capital of Nova Scotia, then under British rule. The Victorian Garden contains over 3,000 vibrantly colourful annuals. The selection of exotic and heritage plants, set in elegant symmetry, reflect Victorian tastes and the wealth of Annapolis Royal during "the age of sail." The Innovative Garden demonstrates modern horticultural methods and is a model for visitors interested in how to design a compact and sustainable vegetable garden in an urban or suburban setting. The historically based core gardens are linked by paths through many other display areas featuring plant collections, garden art, water features and natural areas. Connecting pathways look westward over dykelands, evocative of a way of life centuries ago. One of the most magnificent of the collections, by any standards, is the Rose Collection which has more than 270 cultivars, from ancient roses like the Apothecary Rose through to modern hybrids including roses of the Canadian Explorer, Parkland and Artist series'. With thousands of colourful and fragrant blossoms, it is the largest rose collection in the Maritime region. 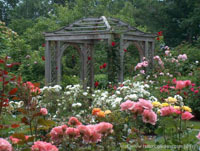 Within its relatively intimate confines, the Gardens contain an astonishing array of horticultural diversity, with carefully designed transitions between the rock garden, the hydrangea and day lily collections, the azaleas and rhododendrons, the perennial bed, the heather collection, the evergreen collection and ornamental grasses as well as spring and winter collections. Then there are the trees - exotic specimens like the blossoming Paulownia (Chinese Empress), the iconic Laburnum Arbour, the fruit bearing PawPaw (unique in the Maritime region), living fossils such as the Dawn Redwood and Ginkgo Biloba, and the majestic weeping American Elm, a provincially designated heritage tree. See for yourself... visit today!